Some years back, the Country Fire Service via its Air Wing ground surveyed the airstrip with a view to its possible use by Air Tractors during fire fighting operations. Where the location and the 1300 metre strip accessed from the main road could be an asset. The site has always had some on-site capability, with tank and pump on some buildings, and a 400 litre trailer mounted fire unit. As this gear has aged, the issue of its replacement has been front of mind. This year, a farm fire unit has been added to the property tray top vehicle, to become the current primary response to bushfire in the area. During 2017 the museum’s workshop resembled ‘mens’ shed’ activity with group working days. 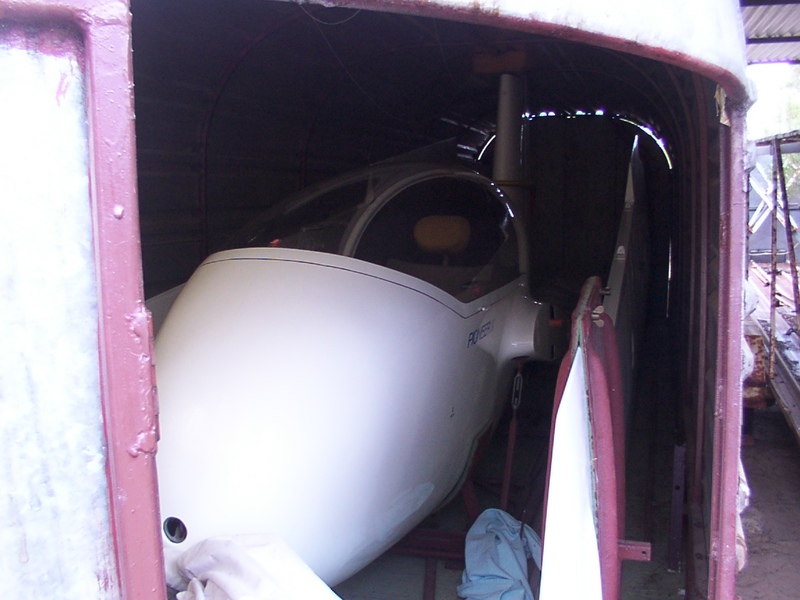 The emphasis was to both repair and refurbish the 2 seat ES52 Kookaburra VH-GHN. 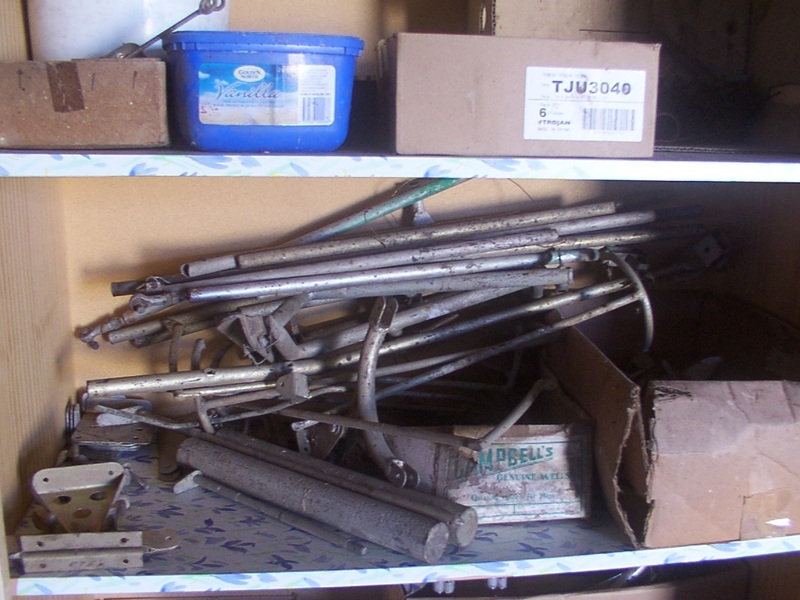 Works included plywood, dacron, instruments, control runs and painting. 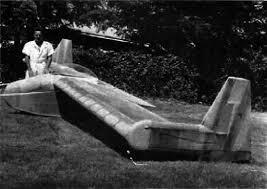 Toward the end of the year the completed airframe was assembled. During 2018 a new perspex canopy made by Ian Linke has been installed. To complete the work prior the airframe is to be weighed and certified. For 2018 the same work team has swung into the counterpart single seat ES57 Kingfisher VH-GRH, with similar repair and refurbishment tasks planned. The early work is on individual parts, to be mated together on the boards shown above. Integral to collecting the ‘fleet’ are on-going tasks in servicing, maintenance and repair of individual airframes. The airframes cross the spectrum from aluminium alloy construction, glass fibre resin mould constructed airframes, and the traditional ‘stick&string’ build in Sitka spruce. Collected together in the shed in this photograph are from rear forward: the aluminium alloy L-13, an ES57 wing in timber construction, the moulds for the DM-12M; and the fuselage of the Es-52 being worked on by owners Ted, Noel, Beverley and Emilis. A contributor routinely noted in the texts below is Beverley. She instigated the South Australian Gliding History Trust from which arose the concept for this museum, and to which she provides artefacts and content. 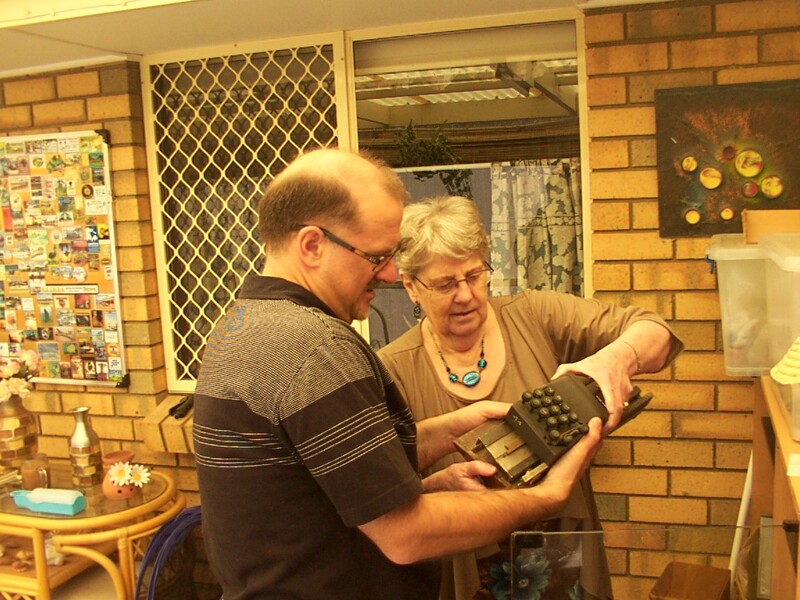 Beverley is seen below in company with Simon Hackett, to which her artefacts from her early (1960s onward) IT work are now transferring to his computer hardware archive collection. Simon & Beverley share receipt of the GFA Muller Award for their publishing/promotion of the sport of gliding in the virtual world. Beverley previously received a Merit Award through Sport SA for her contributions to gliding. Husband Noel Matthews was a long term editor of the sport’s national ‘Australian Gliding’ magazine while it operated with an independent committee in the 1980s. They have extensive archives about the sport. Through such private collections, the sport’s evolution is collected and preserved as well as being integrated with museums such as this one. where you can get a feel for other things we do in other parts of our lives. 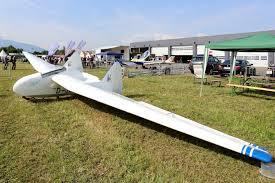 The late John Lynch built and flew what is now the only ‘flying wing’ form sailplane in Australia. This ‘tailless’ layout for sailplanes has been promoted by a succession of people over many decades as potentially offering lower drag configuration and hence higher performance than the conventional ‘crucifix’ layout with a long fuselage and tailplane, elevator and rudder at the rear. The ‘flying wing’ has controls on the wing trailing edge plus either fin and rudder behind the cockpit or rudder drag controls near the wingtips. The debit is that a more stable ‘reflex’ form wing section is used with its inherently higher drag and the CG range is very narrow. Early exponents included the Horten brothers in Germany before 1945, Fauvel in France and Backstrom in the USA in the 1950s (see photos at end of this section). At that time a number of Backstrom EPB-1a ‘Flying Plank’ were built in Australia including the Fred Hoinville supported one now with the Australian Gliding Museum at Bacchus Marsh. A local Glideair design evolved from that – the Twin Plank – is in the Sydney Powerhouse museum. A number of Fauvel AV-36 were homebuilt in Australia in the 1950s as well. 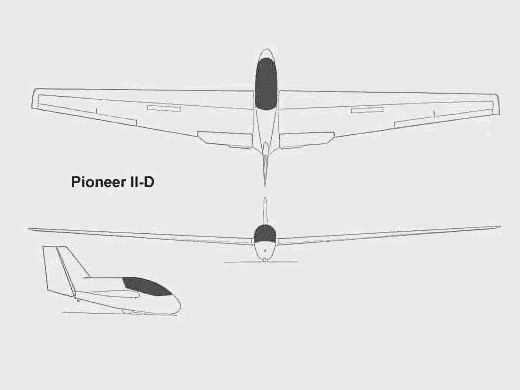 In more recent years Jim Marske in the USA has evolved sailplane and ultralight designs to the ‘flying wing’ layout, including ‘Pioneer’ in a number of variants. The well known global aviator Jon Johansen and his family have taken on John Lynch’s ‘Pioneer’ airframe, which is at present with the Monarto museum. When the sailplane manufacturer E.Schneider Ltd (see note 20 below) shut up shop, a spread of gliding enthusiasts collected diverse components already fabricated, intended for future factory builds, but unused. 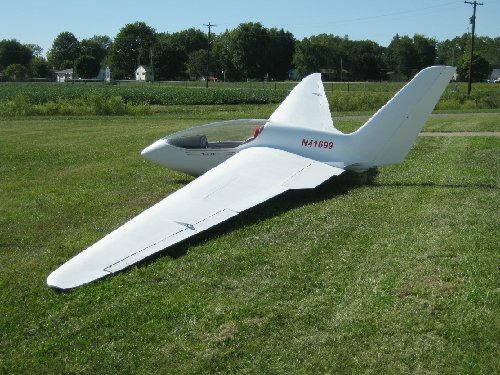 The purpose was to be helpful in future servicing of ES type sailplanes, by being able to use ‘factory fresh’ components rather than making look-alike pieces based on old worn parts. The museum catalogues and retains these components for use. 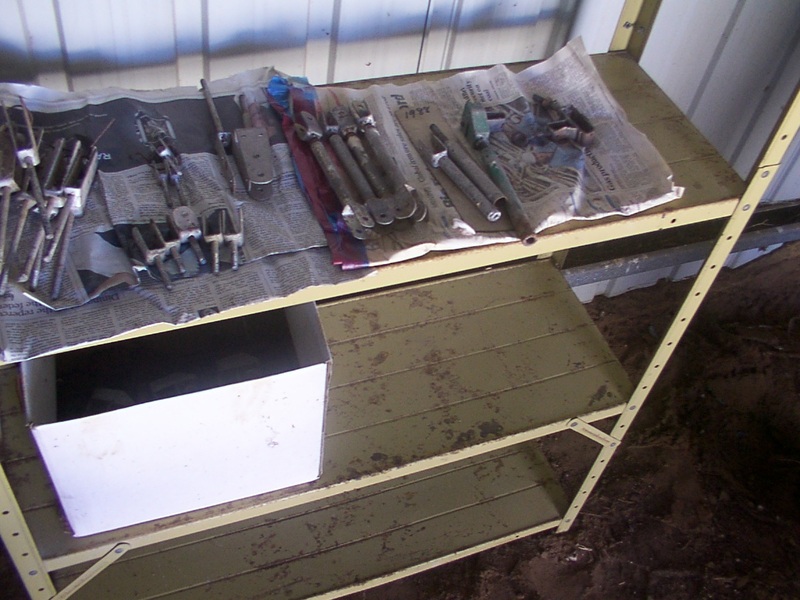 There are other operators in other places around Australia with similar servicing opportunities. Vintage Gliders Australia is a helpful information point in sharing awareness of these depots.